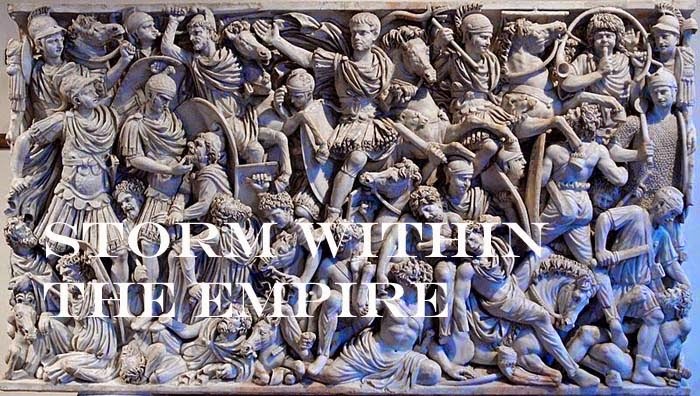 Storm within the Empire: Merovingian Campaign - the system engine. Merovingian Campaign - the system engine. Readers who have followed the many projects I have posted here in the past are aware of a number of historical campaign systems I have designed. Each had a particular facet that I wanted to test and most spanned a number of important events in Roman history. Some simulated a campaign season and others covered several successive campaign seasons, but none would prove as great a challenge as the current Merovingian project. The dynasty, from the death of Clovis to the end of the reign of Dagobert I is nearly 140 years. Electing to have each turn represent ten years would complete this campaign after 14 turns. This can be reduced if any ruler unifies all Francia as one kingdom; which did occur in 558 AD. On the map are a number of realms which interact with the Frankish kingdoms; these are the Frisians, Saxons, Thuringian, Bavarian, Avars, the Lombard, the Italian Ostrogoth, Provence, the Byzantines, the Visigoths and Armorica. As a club project, the task of gathering enough willing players for such a campaign becomes quite difficult. Rather than design a system where a lesser number of players would be required, I decided to create a solo campaign system as finding a few willing club members to fight some battles in an evening is not that difficult. Reviewing the Quick Play Campaign the next step was to revise this for solo use. The system needed a major change as accumulating ‘activity points’ to pay for movement, supply, reinforcements and such would reduce the game to a bookkeeping exercise for sixteen kingdoms. A simpler solution was needed that offered enough possibilities to represent activity to fill a ten year period. I wanted to retain the use of playing cards, some systems make use of them as event cards but this would require too much time to research. I did find a possible solution as there were websites that defined the symbolic meaning of cards, rather than foretell someone’s future it seemed possible to translate this to a ruling house. From a number of websites I accumulated sufficient detail to formulate possible actions. I discovered after a few test, the sequence of cards helped generate a story for each kingdom, each turn. Alliances, invasions, rebellions, prosperous period of peace or famine were beginning to fall into place with each card drawn. Extra detail on the reference sheet added the season and month plus the positive and negative value of each card. Record Sheet displaying each kingdom’s status. What you are now following at the blog is the result of the modified campaign system. I have listed below a number of links presenting which will help you to experiment with your own campaign design.